Monica Trapaga, Murray Fahey, John Knowles and Tim Harding making it up as they go along. At one end of the spectrum, improvisation is an infectiously fun, mentally and physically challenging form of self expression available to just about anyone. At the opposite end, Improvisation is a valuable communication and self-awareness tool that can dramatically increase one’s ability to act confidently and decisively on impulses and seizing the moment. When you gain skills in improvisation, you gain skills in assessing and reacting to a situation quickly, identifying the subtext of conversations, building rapport and speaking confidently in front of a group of strangers. Trained improvisers are unflappable. They roll with whatever is thrown at them because they become experts at turning challenging unplanned moments into opportunities for creating new stories and gaining fresh insights into situations and people. Improvisers embrace risk. Sometimes you have to go right to the edge in order to see over where the treasure lies. Impro improves the mind’s ability to quickly form ideas and present them in a clear, relevant way. Most professions, organisations, sports and creative endeavours can see immediate benefits from someone increasing their ability in this area. Impro Australia’s courses a safe playful environment in which participants can engage in experiential self-directed learning. 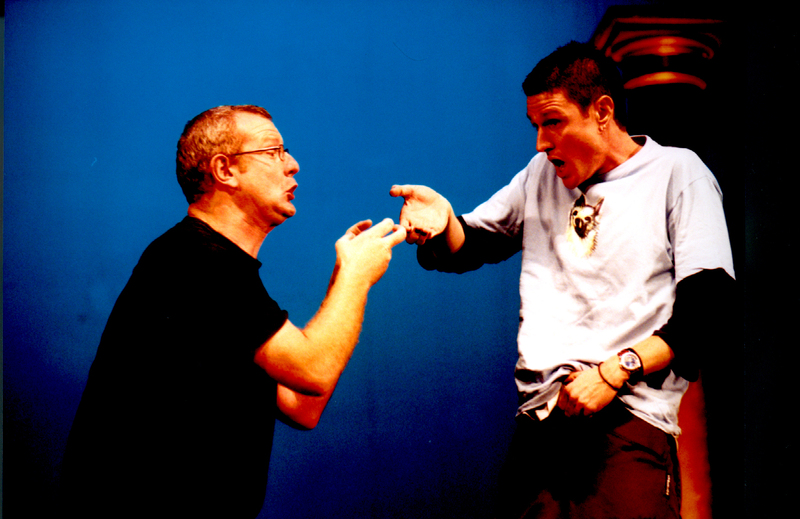 Beneath the fun of each impro activity and every Theatresports game is one or more specific skill to be learned. These skills are highly useful in building your confidence, ability to think on your feet and your and abilities as a competent communicator. The experience and insights that you gain from going through our training can enrich you in a variety of ways. • Ability to communicate non-verbally. Improvisation increases ones ability to quickly access information and concepts from every corner of your mind and apply these ideas to new scenarios and challenges. It is theatrical jazz. Two improvisers that have never met before can immediately launch into scenes, songs and rich narratives because they have learned how to remain in the moment accepting and running with whatever ideas are offered up. Improvisers are constantly observing, reframing and adjusting their actions and behaviours. They make strong decisive decisions while remaining flexible enough to assess and run with any surprises they encounter. Woven into all the laughter and engaging activities are powerful tools for identifying your natural communication style and habits. Exercises will establish where your strengths lie and what areas exist for development. Participants take home insights into how to improve their presentation and one-to-one interpersonal skills. A better improviser, becomes a better communicator. What are you saying before you open your mouth? Most sales training focuses on what the salesperson will say to the client. Impro training emphasises the intuitive and non-verbal communication skills. Using reflective exercises and specific feedback, our impro activities help the participant assess their own performance and provide immediate indicators. Are you a micro-manager without knowing it? Are you able to genuinely accept and run with another person’s idea in place of your own idea? These are the sorts of self awareness questions that Impro Australia’s training can help answer. The personal development benefits will supplement the processes and structures of other training programs. Improvisation increases your observation skills. Improvisers become acutely aware of their surroundings in order to spot any changes or new information being offered. These ‘offers’ as we call them, can come in many forms: visual clues, tonal changes, physical movement, verbal statements, emotional shifts etc. Practiced improvisers are able to pick up on these often very subtle offers and react swiftly and proactively. They develop a sort of sixth sense whereby they can almost feel where an offer will come from or provide one of their own, just as another player requires it. Part of the fun of collaborative improvisation is that the exercises and scenes require you to be you become a very active listener, and in doing so, you learn the joy of drawing out specifics and deeper meanings from your conversations. Turning the tables on the traditional quest to ‘engage the listener’, our training explores the concept of ‘engaging the speaker’ whereby the listener’s job is to actively assist the speaker to flesh out their ideas and stories. Helping someone to extend on and advancing their ideas, from a purely supportive position, has a profoundly energising and freeing effect on the speaker. Improvisers attempt to stay on the crest of the wave, never quite in control, but in the moment, discovering their path as they enjoy an exhilarating ride. People that we have trained tell us that impro helped reduce their fear of being embarrassed or looking stupid, because as they soon discovered, to fail in impro is unavoidable, a necessity and to be applauded. Learning how to embrace your mistakes and turn them into positive opportunities becomes a skill that improvisers carry with them into all aspects of their lives. Impro skills have a positive effect on those who acquire them, helping to break down barriers to communication, embracing change, strengthening diversity and integration of communities. Our courses and training bring people out of their shells and expose their hidden talents. Impro Australia believes that if people can improvise together and laugh together, they can do almost anything together.